Altdice.net - Multi coin dice game. The games are provably fair like always with a 98% expected payout. From their ANN: We believe that everybody should have the ability to play at Altdice.net with the cryptocurrency of their choice. Making that possible for them to do so has been a goal for us for a long time. Bitcoin is becoming more and more the currency of choice to many including Societies Elite. We want to offer the same exact thrills that you could expect to experience at Bitcoin gaming sites such as Satoshi Dice but to everyone. 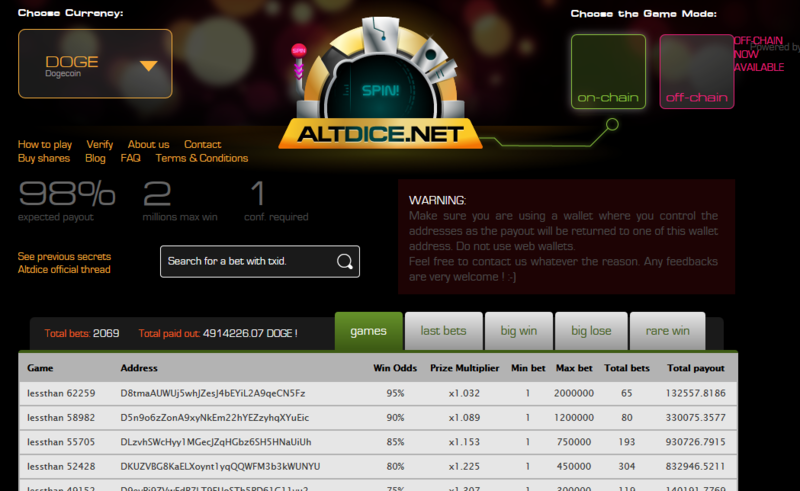 Regardless of whether you're rich or poor, you can always come to Altdice.net and wager with your coins of various value because Altdice aims to provide you with the largest selection of cryptocoins in the industry.